It’s impossible to pigeonhole Perry Louis and understand where he gets his inspiration. Perry did not come through the usual Collector to DJing route, instead starting his career as a Boogie Dancer. He first took to the dance floors of the most iconic clubs in the UK in the early ‘70s, which fired up his passion and excitement for the music which he represents and influences his DJ sets today – all on Vinyl, of course! 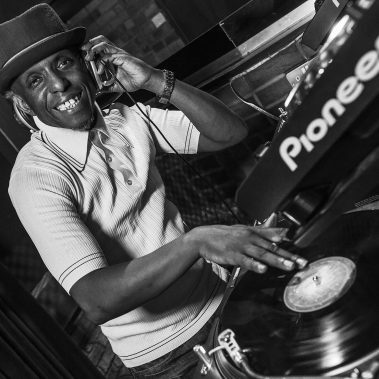 Perry has worked as a JazzFunk, Funk and Jazz Dancer and has a Vinyl collection that mirrors his style of dancing. As a DJ, he specialises in spinning JazzFunk, Pure Funk, Boogie and Dancefloor Jazz mixing in Latin, Brazilian Soul, Afro and Fusion. Unlike the hundreds of dedicated Jazz, Funk and Soul Dancers who simply enjoy turning up to do their thing on the floor and hearing good music, Perry’s love and passion for the music has had him digging for vinyl all over the world to find that elusive track to add to the sound he works very hard at improving – The sound of London’s underground Dancefloor Jazz, Funk and Boogie scene. Throughout his 30 year career as a Dancer, he’s picked up records everywhere he’s travelled to in the world. Perry’s friends know that to go somewhere with Perry means he makes a bee-line to that record shop to sort out that elusive Gem.. So, what started as “Perry’s Red Box of goodies” some years ago has developed into a Very strong Vinyl collection of some of the Funkiest of Funk and Grooviest of Grooves deepest soul as well as some rarest of Jazz that you can’t imagine you’ll hear. And Vinyl means original Vinyl: Perry likes to know that wherever he plays, his audience get the real deal and feels the best way to represent the Oldskool is by playing in an Oldskool Way. • Created Messin’ Around, a club night at the Jazz Café and the 100 Club in London which ran for 13 years and produced 5 compilations on Verve & Freestyle Records. • Created Shiftless Shuffle, a monthly Sunday afternoon Jazz Dance club now in its 19th year at Trapeze, Shoreditch. • Created Shiftless Shuffle, a monthly all-out Dancefloor Jazz club session with a preceding lesson in Jazz Dance, which Perry also teaches. Perry is hugely respected by the Musicians who created the Music that he plays, and he is always a favorite wherever he goes. Over a quarter of his albums are signed by the original Artists: a fact that speaks for itself. Terry Callier called him his favorite DJ, others ask for him specifically to DJ before and after their set. George Duke famously ran up to Perry after a gig at London’s Jazz Café, to find out how he could obtain some of his own records Perry had been playing, as he thought they were not available. Over the years, Perry has DJd for many top Jazz, Soul and Funk Artists such as Roy Ayers; Lynne Collins; James Brown; Maceo Parker; Terry Callier, Marva Whitney, George Duke and many, many others, often at the request of the Artists. And as well as working all over the UK, he has toured as a DJ in lots of places around the world, with most venues booking him repeatedly. Perry takes his audiences on a musical mystical journey and is one of those rare DJs who don’t assume they have to ‘educate the punters’. His love for the music and enthusiasm behind the decks is infectious. Standing still during one of his sets is just not an option! His idea of a great night is to see everybody getting down, whether you are a connoisseur or a passer-by just in for the night. And don’t be surprised if you see him running from behind the decks to get down on the floor himself.